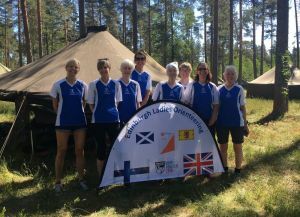 The Venla is a women’s race, for teams of 4 (total distance around 25km) during Saturday afternoon, followed by the Jukola, for teams of 7 (total distance around 79km), overnight. This year there were over 1600 teams in the Venla and nearly 1900 in the Jukola. Lahti is about 100km NE of Helsinki, and the competition centre was at Hälvälä airfield, 14 kilometres west of Lahti city centre. The terrain is complex, characterised by depressions formed in the ice age, some of them 40m deep, in mostly runnable pine forest, with some thicker areas, some open parts, and lots of paths and tracks. The weather was very hot during the day, and it was windy, raising a lot of dust, especially in the handover area. Laura Robertson ran 1st leg, finishing in 108th place. The team came 40th, in a total time of 3:03:00. Jo Stevenson ran 1st leg, finishing in 163rd place. The team came 101st, in a total time of 3:17:56. Sheila Strain ran 1st leg and finished in 1431st position; Fiona Hendrie (FVO; Alison’s sister) ran 2nd leg, finishing 1257th; Jeni Rowe ran 3rd leg, finishing 1338th, and Alison Cunningham ran 4th leg, finishing 1230th. Their total time was 5:47:57. Janice Nisbet ran 1st leg and finished in 1468th position; Morag McIntyre (INT) ran 2nd leg, finishing 1386th; Anne Stevenson ran 3rd leg, finishing 1332nd, and Patricia Alston (INT) ran 4th leg, finishing 1396th. Their total time was 6:25:33. Rona Lindsay ran 2nd leg – she took over from Louise Adams in 472nd place, and finished in 356th place. The team finished in 139th place in a total time of 3:28:03. Andrew Lindsay ran 2nd leg for team 1880 (EUOC 2) – he took over from Callum White in 346th place, and finished in 322nd place. The team finished in 312th place, with total time 11:24:24. For full results and other information about both events, see the Jukola 2018 website.